For the past two years the Leadership Centre, in collaboration with NHS England, has been providing Systems Leadership support to places across the country as part of the National A&E Improvement Programme. The support has involved working with NHS representatives and other stakeholders from local government and the voluntary care sector on local A&E Delivery Boards across England, developing more collaborative leadership to support improvements in Emergency Care performance. London: Imperial and Barnet & Enfield. One of the biggest problems we have is around delayed transfers of care. We all know that but when we talked about it before it was all about blame and ‘it’s your fault’. The Leadership Centre helped us to change the conversation to ‘what can we do? How can we solve this problem collectively?’ We have recognised that if we sit back and just keep blaming social care nothing will change. Our focus has been on mobilising whole health systems to re-imagine the way they collectively work in service of their populations. Teams of Leadership Centre Enablers have been working on the ground alongside clinical and non-clinical staff, politicians, officers and citizens in places to help strengthen relationships and trust amongst key individuals, as the starting point for improving leadership capacity. The Leadership Centre support has enabled local leaders to obtain a clearer, common understanding of what the underlying complexities might be across A & E departments in England; to reveal and connect more of the interconnected system to itself, thereby deepening local understanding and relationships; and to create enough clarity to proceed to action whilst working on ever evolving issues. Throughout, the Leadership Centre has worked closely with the Emergency Care Improvement Programme, to ensure we do not duplicate work or effort, and so that our respective programmes complement each other and add value to the places. Leadership development support can often be too removed from the day-to-day realities, and people can struggle to find applicability to real work. Because this programme has been embedded in the actual work of the A&E delivery board, and the leadership team have actually been there, that life coaching, guidance and mentorship has been really beneficial. The Leadership Centre’s approach is sharply different to the traditional approaches to supporting local health systems. We are not trying to ‘fix’ the local health economy, performance manage it or tell its leaders what to do. Instead, our approach is to collaboratively develop new ways of thinking, behaving, learning and working together, in the context of their locality, so local leaders build shared trust, meaning and action to nurture the transformational change they desire. Our support has run alongside live programmes, so it is focused on building the capacity of systems leaders to work through the issues they are grappling with every day, and the relationships that underpin them. We have periodically brought together those involved to share their learning and insight whilst developing a network of mutual support. As time has gone on, and as outcomes have become more visible and established across the NHS, the emphasis has shifted to broader leadership development in Sustainability and Transformation Partnerships (STPs) and Integrated Care Systems. Throughout the two years there has been clear evidence of progress, including the development of common purpose across sector and professional boundaries, different behaviours, improved relationships and new working methods. This has been further recognised in CQC reports around the ‘well-led’ criterion. 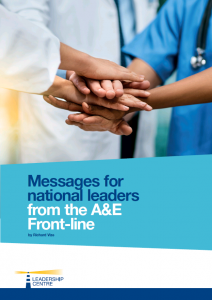 Together with public policy journalist Richard Vize, the Leadership Centre has published initial findings and recommendations from the work in ‘Messages for National Leaders from the A & E Front Line’. I was surprised at the intensity of the work and the level of resources and energy expended. This is not some wafty consultancy exercise but real work on hard-to-shift issues.” She described systems leadership as “incredibly, massively important” to strengthening the A&E system: “You can’t deliver healthcare alone – we need more connections and pathways. We had a deep dive into the local health economy to understand what the issues are. I felt quite embarrassed at first, like airing dirty washing, because there had been such a breakdown of trust. But it allowed us to be a bit more open and honest.